Knock, knock. Is John Fairley home? It was a sad day. We lost Gregory today when a snake bit him on the leg. Gregory was a hard worker. He always had a big smile, even when the woods were hot and thick with bugs. But what I’ll miss most will be his beautiful singing voice. Even though he was only fourteen, he was a joy. I think the cows will miss him too. I guess that old hound dog is missing him; he hasn’t stopped baying since Gregory closed his eyes forever. The sun shone brightly after several days of heavy rain. Gregory’s brothers and uncles didn’t have any problem digging the grave for poor young Gregory. The ground was soft. Mama J wept and pulled her hair. I’m glad Papa George stopped her from pulling it all out. My heart aches for their loss. 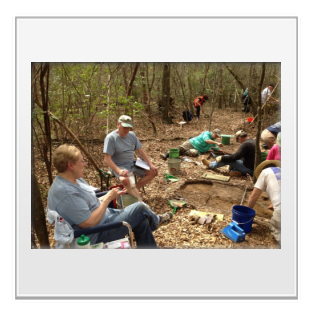 The main intention of this spring’s Passport in Time project was to give volunteers experience with trying to excavate a possible historic homestead on the De Soto Ranger District. In the fall of 2014, we had found several hot artifact-wise spots. One of these was the focus of the spring excavation. First, why are we concerned with John Fairley? John Fairley was born 1763 in Argyleshire, Scotland. He was the youngest of seven children in a marriage between his father, John Fairley, Sr., and his mother Margaret Stuart. The Fairleys moved to the southern part of North Carolina near the city of Charlotte around the time of the American Revolution. John got married to Katharine Crawford in the 1790s, starting the family with a boy in 1797, Alexander “Sandy” Fairley. 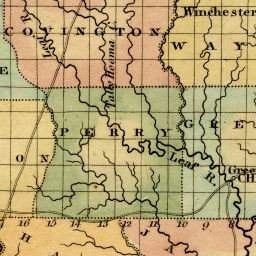 Sometime after the tenth child, Flora, was born in 1815, the family decided to move west to the new territory of Mississippi. We are not sure how long the trip took except that they arrived sometime during the second wave of settlers into the area, which was between 1818 and 1819. Before the dramatic troubles that were present between 1812 and 1816 were greatly diminished with the end of The War of 1812 and the pacification of the Creek tribes in the present state of Alabama. 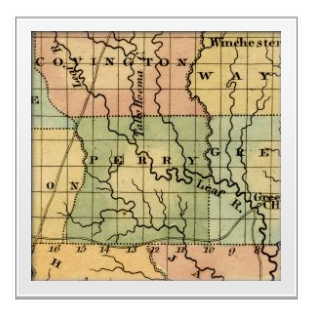 These troubles halted the first wave of settlers into the Mississippi Territory. John Fairley’s two nephews moved to the territory sometime in 1818, but it is not known if they travelled with John’s family or paved the way for them. Both nephews served as government officials with the older brother, Peter, serving as the Justice of the Peace starting in 1818. His younger brother, John, was Justice of the Peace six years later. They both lived around the current town of Benndale, which was the temporary seat of Jackson County. With the different waves of settlers and various explorers, there were plenty of trails for John Fairley and his family to use. Generally, the trails started off as old Indian trails. If they were well situated, they became roads. These trails would have been widened by the American government in order to connect the old cities such as Philadelphia and Charleston to the new city port of New Orleans, and increase the flow of people or settlers into the American territory. John Fairley and his family settled in an area of the district called the Red Hills. This area is filled with high ridges overlooking Black Creek, a major drainage in south Mississippi. How do we know? Well, the family cemetery is present and served as the starting point for our overall Fairley project. 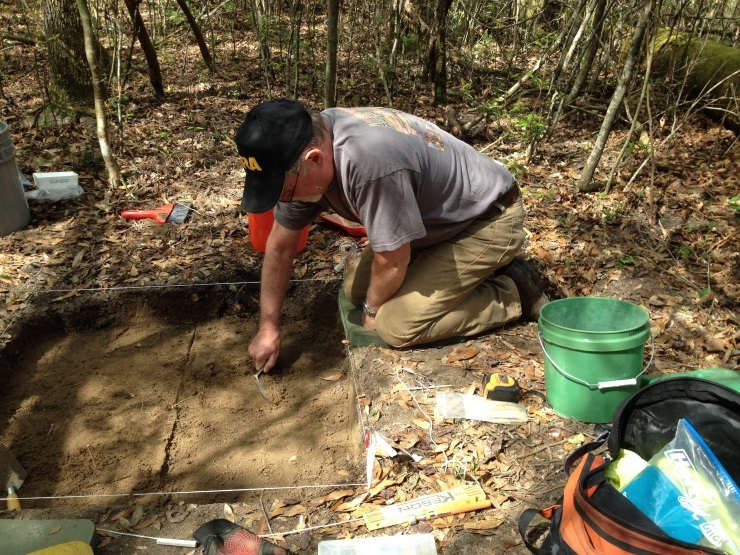 Did we find where the family and other group members (slaves, workers, in-laws) live? This is a question that we were going to try and answer. We all started at Ashe Nursery on Monday morning, getting ready for the next few days. The project would start on Wednesday, March 18. A main trail was laid out for the group to travel from the parking area near the cemetery to the site. Thanks to Keith and Lee for the steps on the difficult down slope. Sabrina, Benny, Gena, and I got the initial units in place. A few students from the University of South Alabama stopped and got roped into helping. Everybody also assisted in getting the equipment to the site. Everybody rocked, thanks! 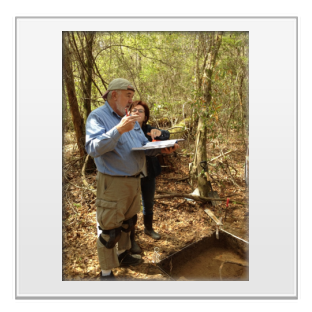 On Wednesday, after introductions, a few laughs, and Carl’s insistence that I was taking too long, we headed out to the site. There were a few complaints about how far and how difficult the trip was, but the ones from Carl were ignored. I did warn people in the application process. I’m not sure why everybody comes out into the woods, work hard, get dirty, and suffer from Carl’s presence. I must attract masochistic individuals (ones who love abuse and thrive on it). Well, I guess you asked for it. First, we started with several units spread out around the central datum. The artifacts were light. Were we in the right spot? Did the former occupants sweep the artifacts in a big pile somewhere else? And just who is in charge here, Sabrina? 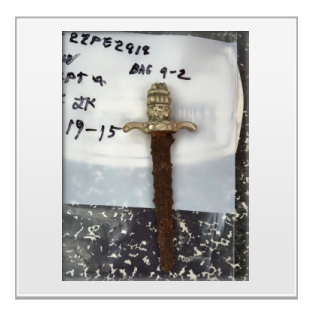 The artifacts included a sparse collection of machine cut nails, possible brick fragments, miscellaneous metal fragments, plain whiteware, bottle glass fragments, a black glass button with a missing metal loop, flakes, prehistoric pottery, and fragment of a projectile point. This was all found the first week. Machine cut nails date between 1815 and 1920. Whiteware dates between 1860 and 1930, while the bottle glass is dependent on several factors including color. One of the pieces was a dark olive green, which indicates a mid-late 1800 alcohol bottle. 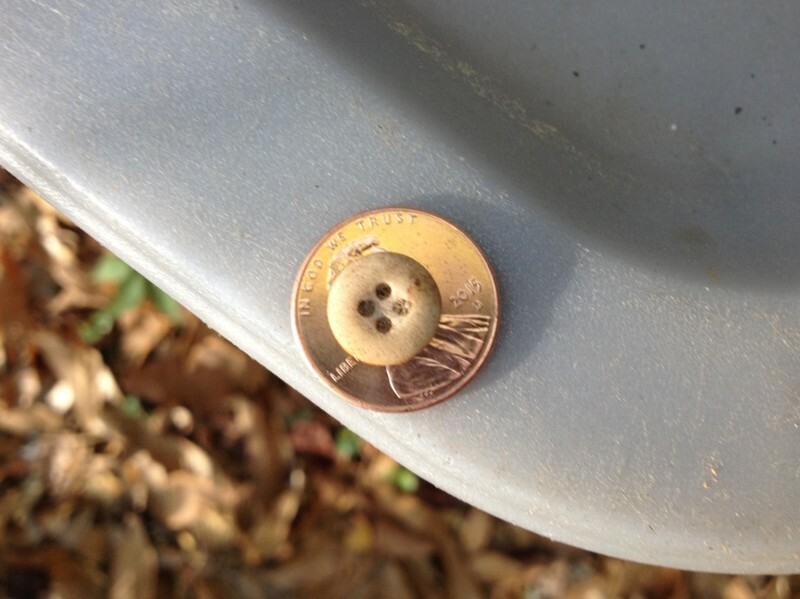 The black glass button was probably from the mid-1800s, but I guess the question is why the artifacts were so sparse. 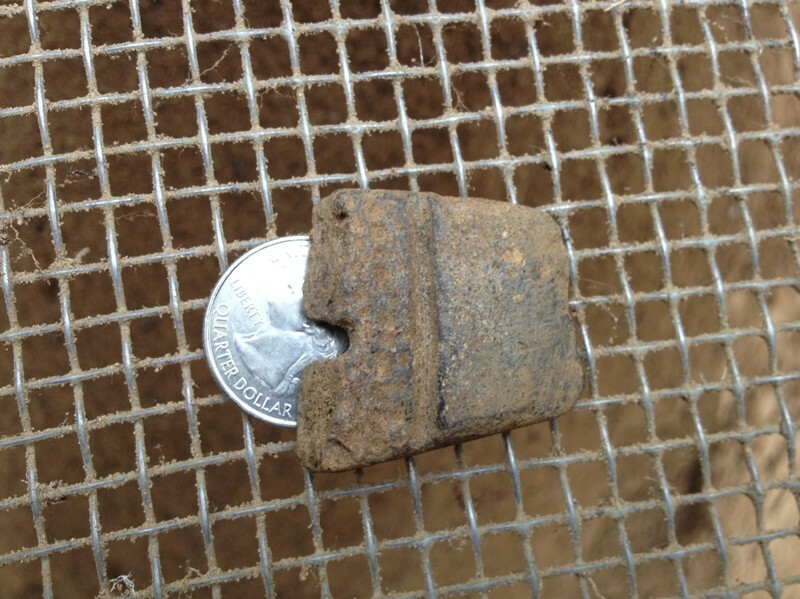 During the second week, the historic artifacts were still sparse, but there seemed to be heavier densities near a pile of brick/clay chinking. The artifacts also continued its strange mix of ordinary and extraordinary. 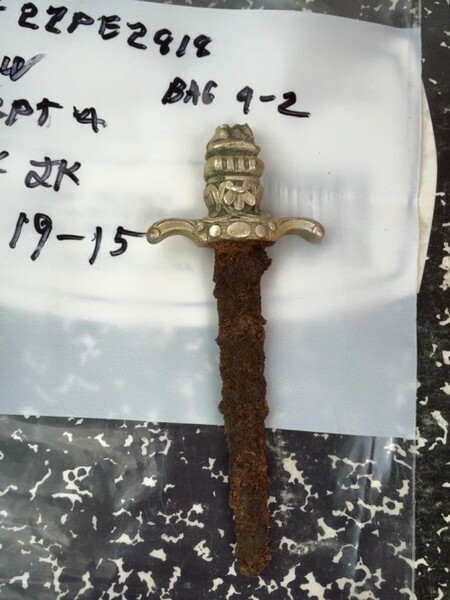 Some of the extraordinary finds included a broken letter opener topped by a figure (only the naked feet were left), more black glass buttons, a porcelain doll hand, a straight pin in a ball of resin-like material, a thimble, and two pieces of slate. The ordinary objects included whiteware, stoneware, bottle glass, more brick/clay chinking, miscellaneous metal pieces; machine cut nails, flakes, a projectile point, and more prehistoric pottery. 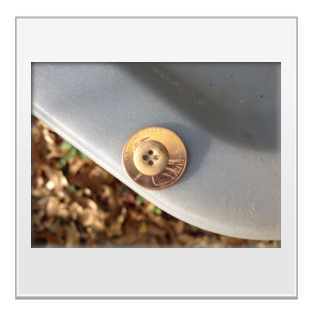 The historic ordinary objects still indicate a mid-late 1800 homestead, but the extraordinary ones seem to indicate something special. Was someone a seamstress at the site? Were they doing the sewing for everybody white/blacks or just a certain subset of the family? And what’s with all of this prehistoric stuff? I know it’s a great spot, but these things are messing with my pristine historic site. During the last week, the school kids invaded the site. Most of the volunteers ran and hid, but there were a few brave souls that assisted with the kids’ education (for bad or good). Thank you for sacrificing a couple days of your golden years. I’m sure the kids benefited from everybody’s wisdom and experience. Anyway, enough brown-nosing, it was another strange week for artifacts. The historic artifacts were still sparse, but there were more extraordinary and isolated bizarre finds. What was going on? The prehistoric artifacts exploded (not literally) in the units near the edge of the spring-fed drainage. The kids’ units yielded numerous expedient flake tools, points, and other things of interest including a broken gorget made from a pottery sherd. Now, it wasn’t a surprise to find prehistoric artifacts on this low ridge. 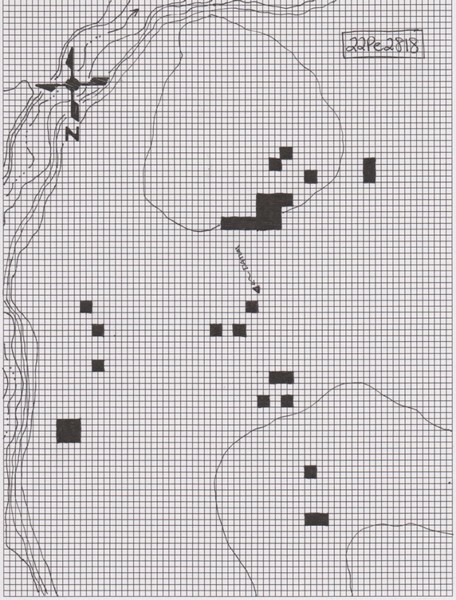 In the scheme of the district archaeology, this area should have been the prime spot, although the densities and depths were less than expected. Now let’s get back to the historic artifacts. Was this area the Fairley’s main house or something else? Why the continuing mix of extraordinary and ordinary artifacts? And Carl needs to stop talking for a minute so I can think. I don’t know when Benny will bring your new magnet to you, maybe he left the country? 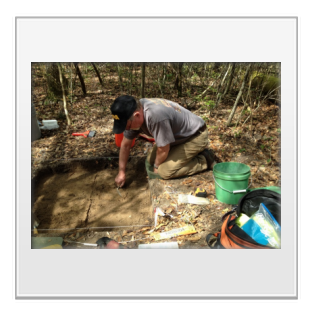 The main job of the excavation crew was to find a structure, well really any structure related to John Fairley’s family initial entry into Mississippi. 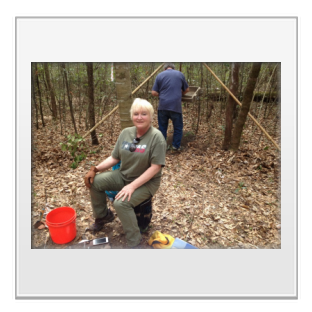 This task was made easier by having some of the best weather in some of the prettiest woods in the area except it did get hot on a few days. We found a possible old entry road, one that traveled from the creek to the top of the ridge we were digging on. What was on this road? 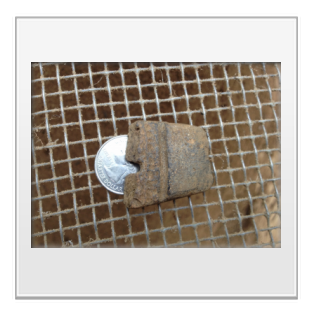 An occasional machine cut nail and mule shoes were located by Roy and Rhonda through metal detecting. Along the road, an odd assortment of metal utensils, nails, and animal husbandry items were found just below the surface. These weren’t the only animal related artifacts found. Sabrina, Bruce, and Cathy dug up some barn related stuff in the southern units. The units around the brick/clay chinking area resulted in either household work items like for sewing or living items. Most of the living or kitchen items were plain, but if they weren’t, they were broken. 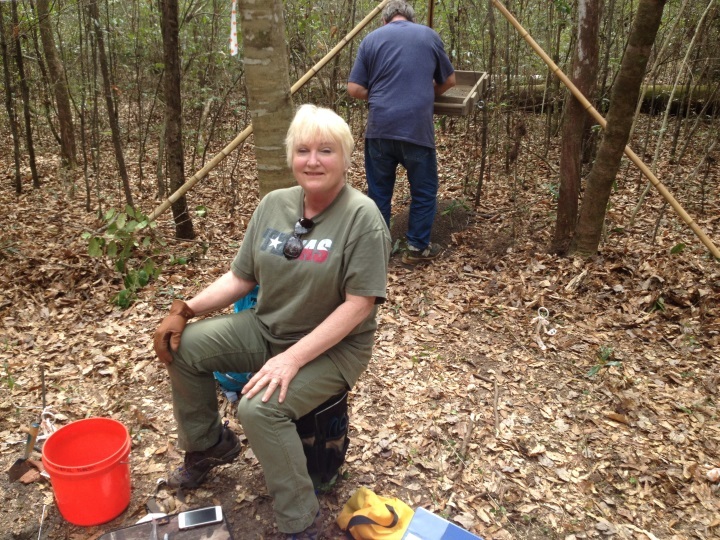 Is this an indication that we found the slave cabins which were by the animal pens/barns? 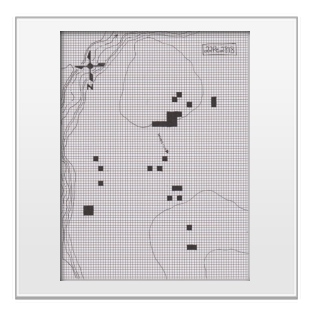 Several weeks after the excavation, Benny and Gena sent me an online article from the New York Times. 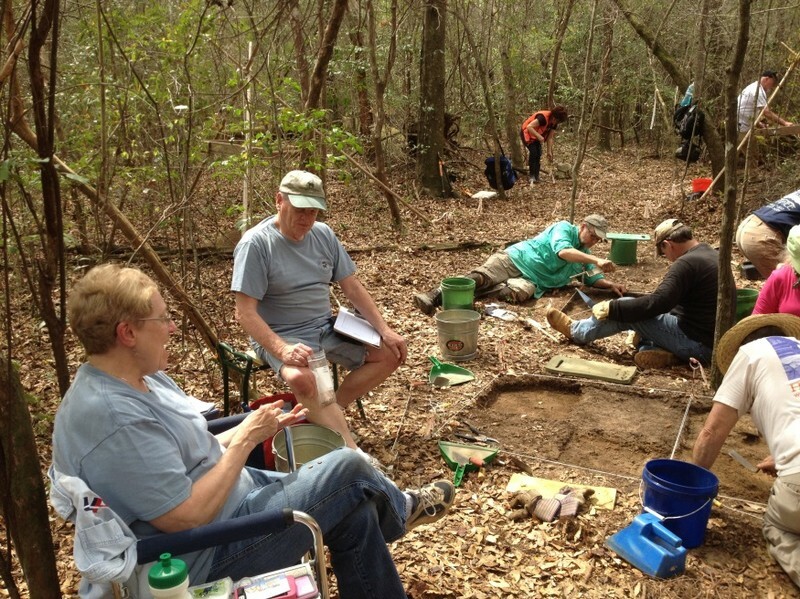 It discussed the excavation of a slave cabin in South Carolina. 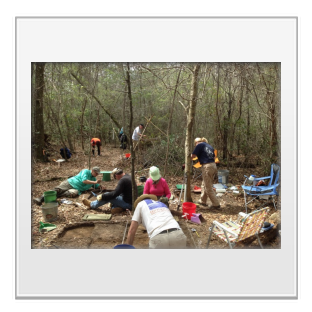 Many of the same types of artifacts found there were found during our excavation. Is this semi-proof? If it is, then where the heck was the Fairley’s main house? This is another interesting and loaded question. I don’t think we are quite through with the exploration of this ridge. I would like to find some kind of house structure indicator (feature) before we leave. 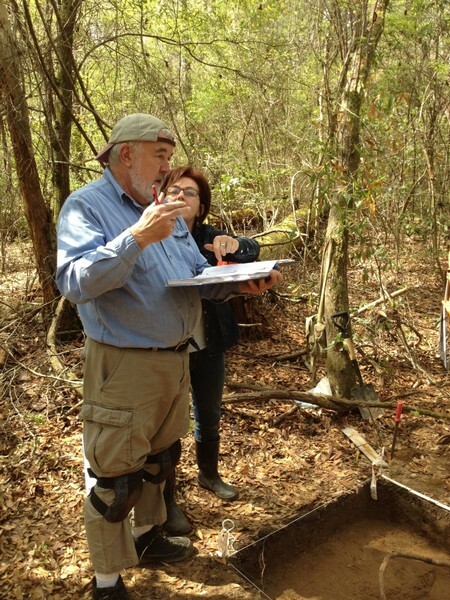 Bruce and Cathy may have found a couple of small post holes in the far southern unit. They were not big enough for a house or even a slave cabin, but they were big enough for a small elevated shed (chicken coop) or even a yard fence. I’d like to explore the area north of the last northerly units toward to creek, but west of the road. Is this a better spot for slave cabins? Maybe even digging south closer to the pipeline or even on the other side of the pipeline would be fruitful. 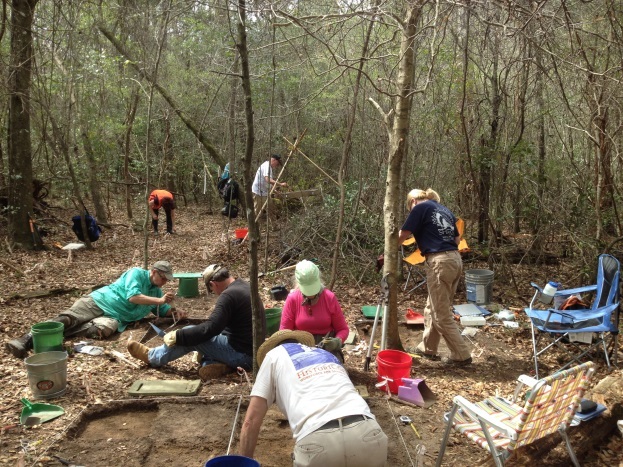 In addition, during the survey, artifacts were found on the ridge to the west (other side of creek). Most of these artifacts were either prehistoric or related to animal husbandry. Could there be more pens/barns on this ridge? Thanks for coming. Thank you for deciding to interrupt your busy lives to drive to the backwoods of south Mississippi. Please come back for more fun.